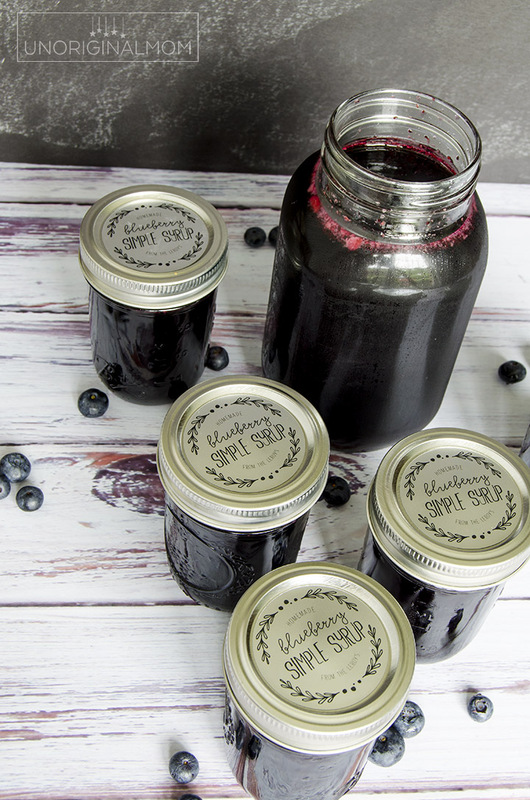 It’s blueberry season! My kids are berry-obsessed, so in the summer when strawberries and blueberries and raspberries are affordable we buy them all the time and eat them up like nobody’s business. So three years ago I decided to buy a 10 pound box of blueberries from our local Kiwanis club, which they take orders for each year as their big fundraiser. They came straight from a farm in New Jersey and they were ah-mazing. We’ve been getting them every year since. Of course, it’s hard even for us to actually eat all 10 pounds of blueberries before they go bad (though we do make a pretty big dent in them! ), so I end up freezing a lot of them to use in pancakes, smoothies, and muffins throughout the year. 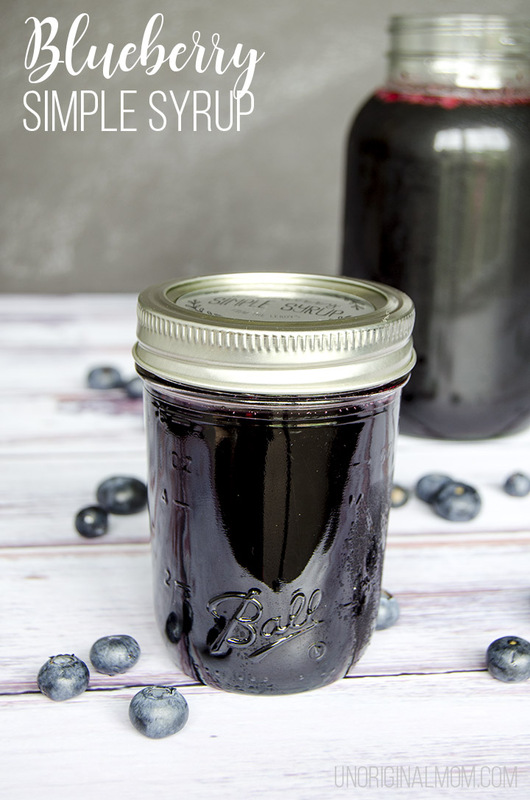 But last year, at the recommendation of a friend, I decided to try a big batch of blueberry simple syrup for making delicious blueberry cocktails – and I was hooked. 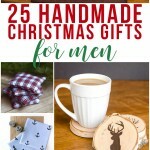 So this year I made another big batch and decided it was worth sharing with all of you, because it’s SO easy and SO delicious. 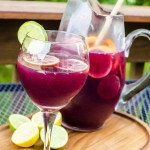 I love mixing up summer drinks – both cocktails and mocktails – with blueberry simple syrup. Mix with lemonade for a refreshing afternoon treat, and even add a splash of 7-up or club soda for some fizz. 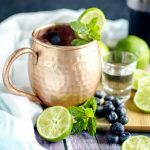 For a grown-up drink, use blueberry simple syrup to make a blueberry mojito, a blueberry lemonade vodka spritzer, or add some blueberry to your gin and tonic. It’s even really yummy on pancakes or ice cream. So many delicious combinations to try! Simple syrup really isn’t very thick, so if you’d like a thicker consistency (like more of a pancake syrup) you can let it simmer a bit longer. 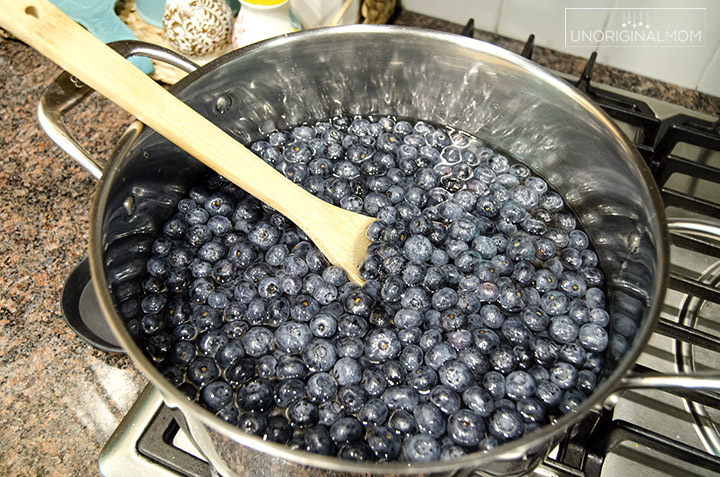 Strain the mixture into a bowl and use a spoon to get all the liquid out that you can, just don’t press the berries too hard or your syrup will be cloudy. 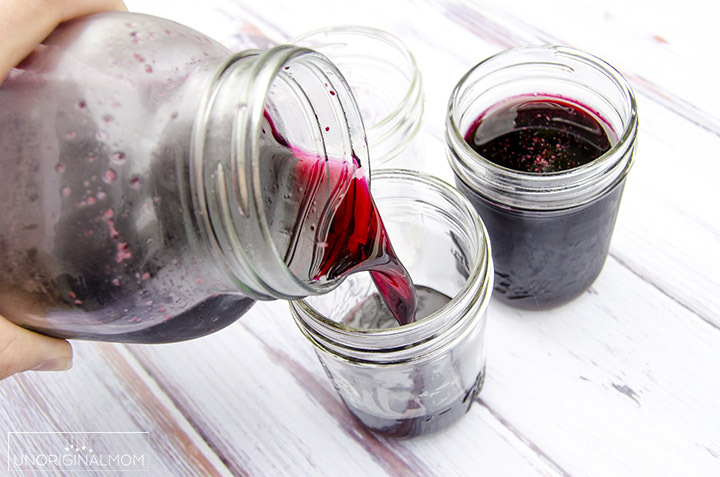 (Tip – DON’T throw away the berry mush you have leftover in the strainer – it is DIVINE on top of some vanilla ice cream!) That’s all there is to it! 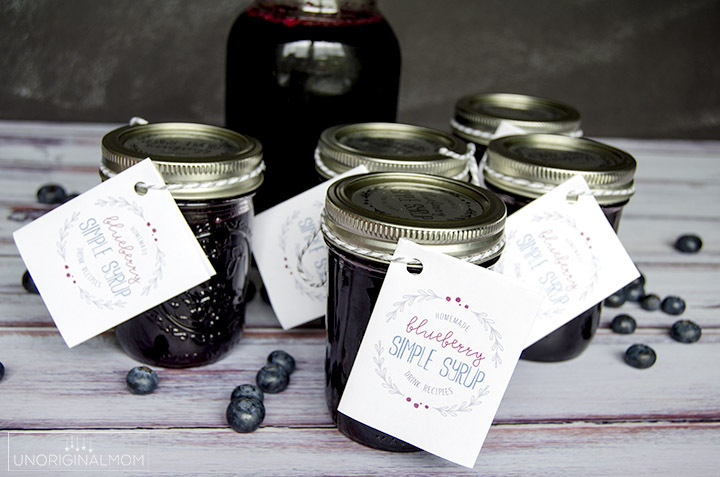 Keep it refrigerated in an airtight container and it should last for a few weeks. 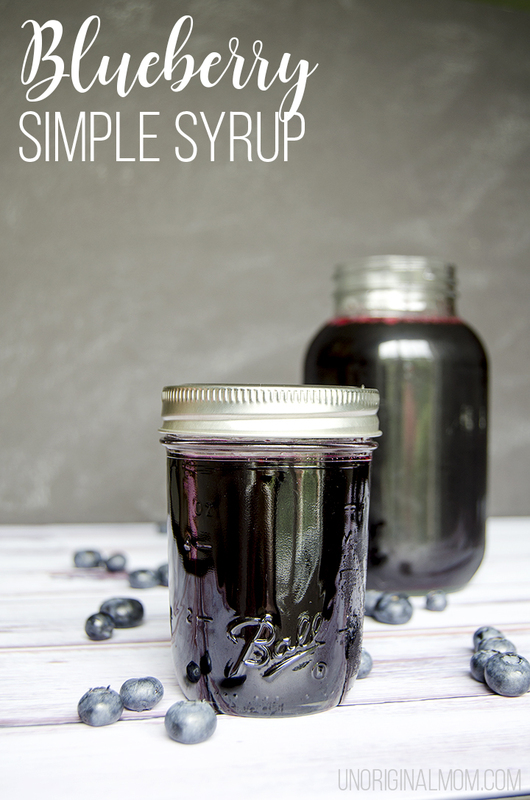 I made more simple syrup than we could possibly drink ourselves, so I decided to divvy it up into some half-pint mason jars to give away to some friends. 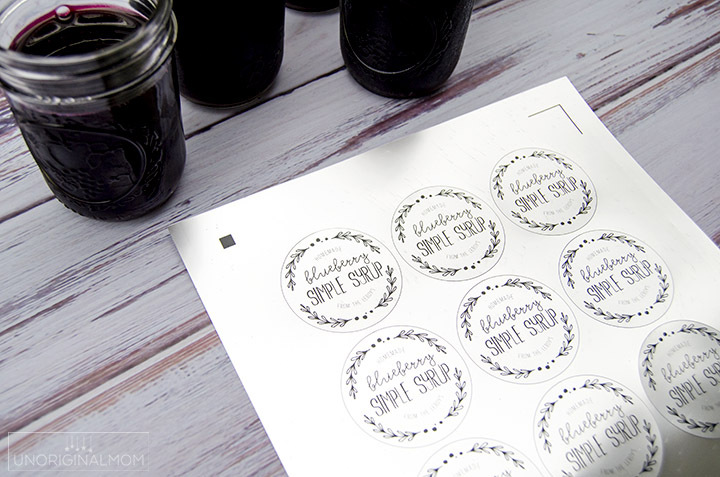 And because I love packaging things up in cute little ways, I used my Silhouette to whip up some tags on Silhouette brand printable silver foil sticker paper. 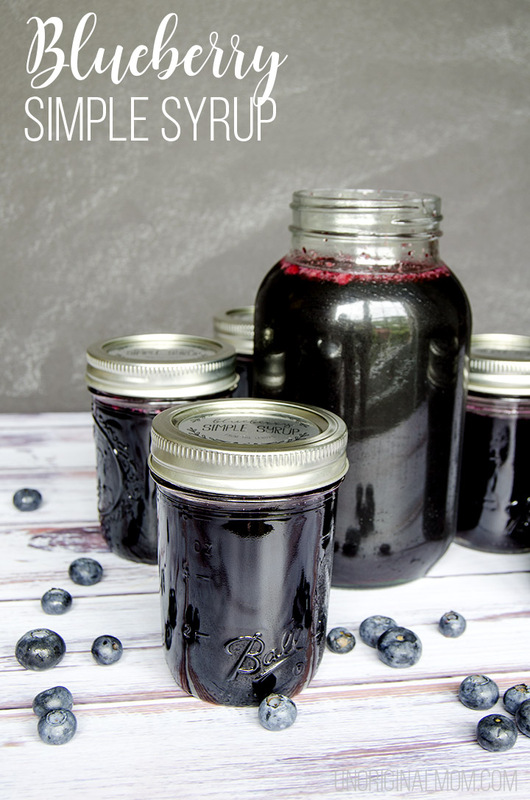 I also put together a little recipe idea booklet to go along with it, complete with 6 blueberry cocktail recipes plus ideas for non-alcoholic drinks. 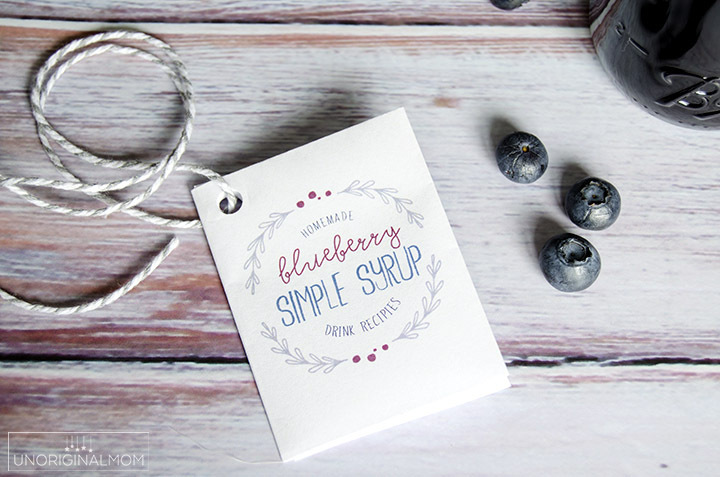 If you’d like to print out your own blueberry simple syrup drink recipe packet, download and print it here! (For personal use only, please.) It’s formatted two to a page, so cut it in half. Then fold the long edges together, fold in half again with the short edges together and crease, unfold, and then fold each edge into the center, then refold so you end up with a little booklet of recipes. 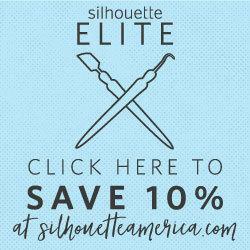 It’s a fun way to give the gift of a summertime happy hour! 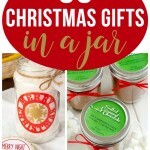 If you were feeling extra generous, you could even wrap them up with some of those single serving bottles of rum or vodka from the liquor store.